The fabrication plant provides contract metal stamping and fabrication to high-end manufacturers across a multitude of industries. To keep up with the increasing demands of their bustling workshop, they decided it was time for an upgrade. Eager to clear the path for newer models, the company needed to get rid of about 80 of its presses and fabrication machines, but they weren’t sure how to go about it. They’d faced difficulty in the past with consistently find buyers for their old machines. Working through individual dealers proved time consuming, and in many cases, they were left with no choice but to scrap machines which were still well within saleable condition. When an MMI rep proposed a managed auction, the company decided it sounded like a good fit for their needs and gave it a go. Using their fully staffed marketing team, MMI got the word out about the auction. They deployed targeted marketing strategies through their database of over 150,000 subscribers, as well as from additional industry digital and direct campaigns. They also leveraged their social media presence toward achieving their customer’s goals. Finally, going beyond the web, they also managed to get ads for the new machines into various machining trade publications. The auction was a success. Despite the volume, MMI was able to market and sell each of the over 80 fabrication machines. With space in their shop cleared and a lot of extra money in their pockets, the fabrication plant was able to buy a full set of new machines to support new projects and processes, and their business is doing better than ever. 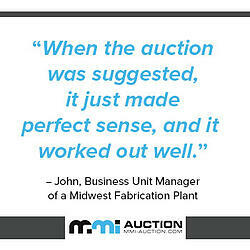 Learn how to sell your surplus machines at auction with MMI. 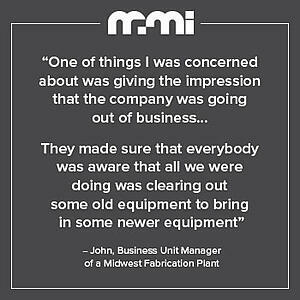 Learn how MMI can help you manage surplus or depreciated machinery assets. Want to know how to participate as a buyer in MMI Auctions?